In previous tutorials, we learned how to draw simple shape-based selections with Photoshop's Rectangular and Elliptical Marquee Tools. Using these tools is easy enough, yet it's amazing how frustrating it can be sometimes to draw a selection in exactly the right shape, size and location we need. 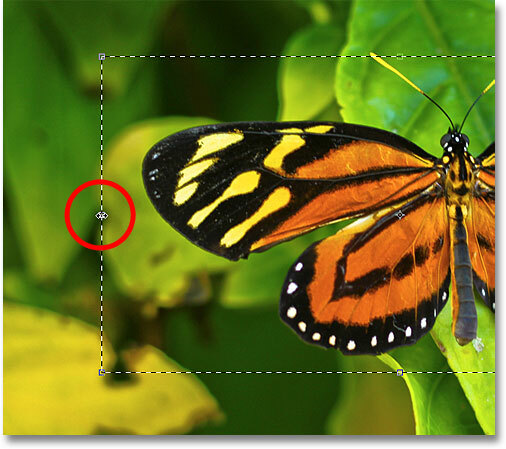 Often, we click in the wrong spot to begin the selection, or we wish we had made it wider, taller, further to the left or right, or whatever the case may be, leading many Photoshop users, especially beginners, to undo the selection and try again, and again, and again until they finally get it right. 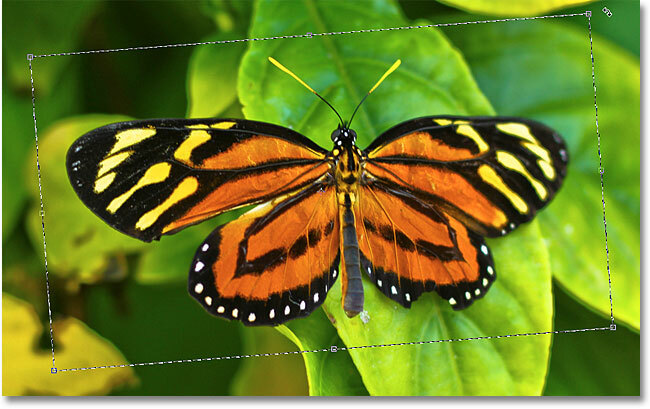 Fortunately, there's no need to go through all that hassle and frustration because Photoshop makes it easy to move, resize and reshape selection outlines after we draw them using the Transform Selection command! 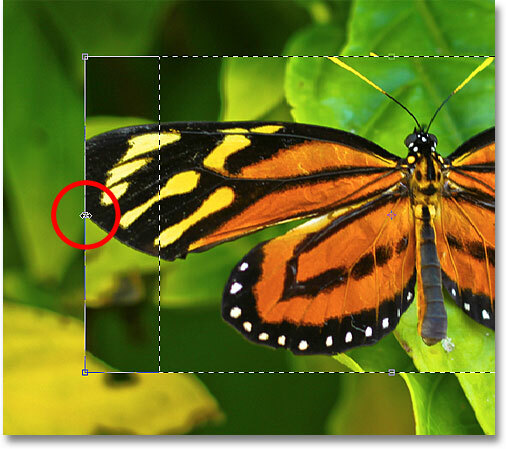 Dragging out a rectangular selection around the butterfly. My first selection attempt didn't turn out as well as I had hoped. What many people would do in this case is undo the selection and try again, hoping they get it right the next time, but why keep starting over when we can just fix what we already have? That's exactly what we can do using the Transform Selection command. Before we look at how to use Transform Selection, it's important to note the difference between it and another similar yet very different command, Free Transform. Both are used to move, resize and reshape selections. The difference is that Free Transform affects the pixels inside the selection outline while Transform Selection affects only the selection outline itself. Selecting Free Transform from the Edit menu. Resizing the left edge of the selection with Free Transform. Since Free Transform affects the pixels inside a selection, all I've managed to do is stretch the image itself. 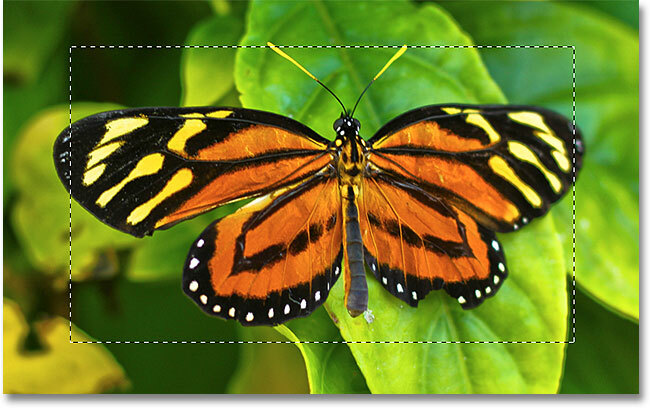 The selection outline, which is what I wanted to resize, didn't move, and the butterfly's wing now extends even further outside my selection than it did before. In many cases when retouching images or creating photo effects, resizing and reshaping the image with Free Transform is exactly what we want to do, but not in this case. I needed to resize my selection outline without moving anything inside the selection. For that, we'll need the Transform Selection command. Clicking on the left Transform Selection handle and dragging it further to the left. Dragging the right edge of the selection outline further to the right. Dragging the top Transform Selection handle. Rotating the selection outline without rotating the image inside the selection. 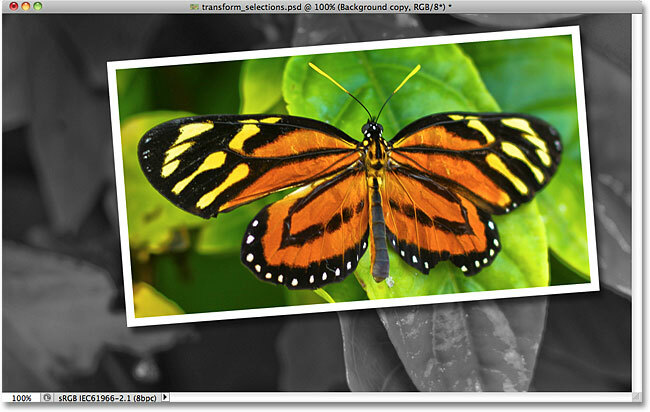 When you're done, press Enter (Win) / Return (Mac) to accept the changes and exit out of the Transform Selection command. The selected area is copied to its own layer above the original image. The Stroke options in the Layer Style dialog box. 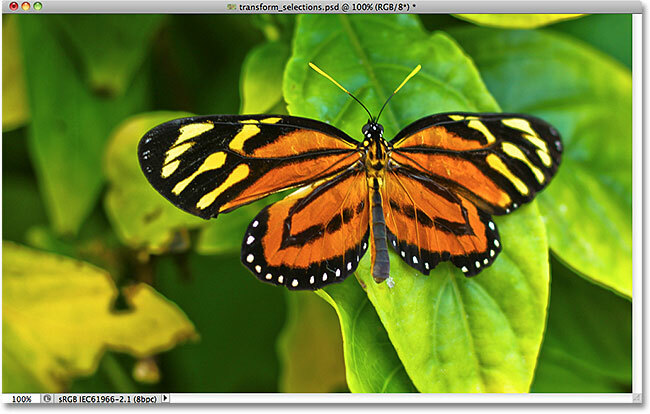 The butterfly now appears to be in its own photo within the larger image. Creating a copy of the Background layer, then desaturating the copy. And there we have it! For more on Photoshop's selection tools, see our complete How to make selections in Photoshop series. 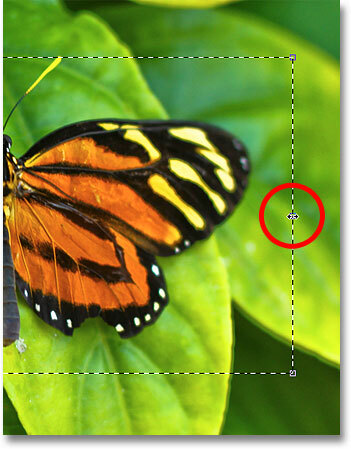 Visit our Photoshop Basics section for more tutorials on the basics of Photoshop!